Ozarka is made in Texas? That ain’t natural. I feel like the kid who just found out about Santa Claus, or, in keeping with the season, the Easter Bunny. My illusion has just been shattered. Ozarka® water is not made in Arkansas. I just assumed it was. But what do I know, I live in Arkansas. Nonetheless, I was just being logical, or intuitive, at least. “OZARKA” sounds like it’s from around here, our “Natural State” of hot springs and rolling hills and trout fishing. And the Ozark Mountains. 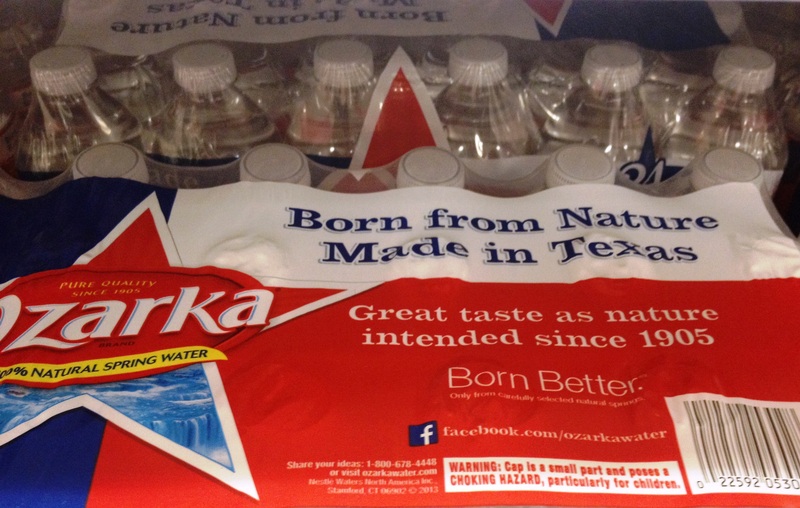 Ozarka’s packaging boasts it’s made in Texas. Texas? Texas water? Is that supposed to be good? I grew up in Houston. I think the tap water in Little Rock tastes better. And there’s no such place as Hot Springs National Park, Texas. Pull back the curtain, Toto. Egad, the Wizard of Ozarka is just one of many brands pumped out by Nestlé Waters North America. Thus we have an Arkansas-sounding label coming from the Texas operations of a North American company based in Switzerland. Yodelayheehoo. Oh well, it’s just water, the commodity that’s increasingly never common. Last time I checked, a liter of Evian was selling for $1.99 at the local Kroger. A liter of Kroger’s store-brand water was 69 cents. That’s a 188% premium for Evian. Some people take this brand thing way too seriously. And the marketers smile. 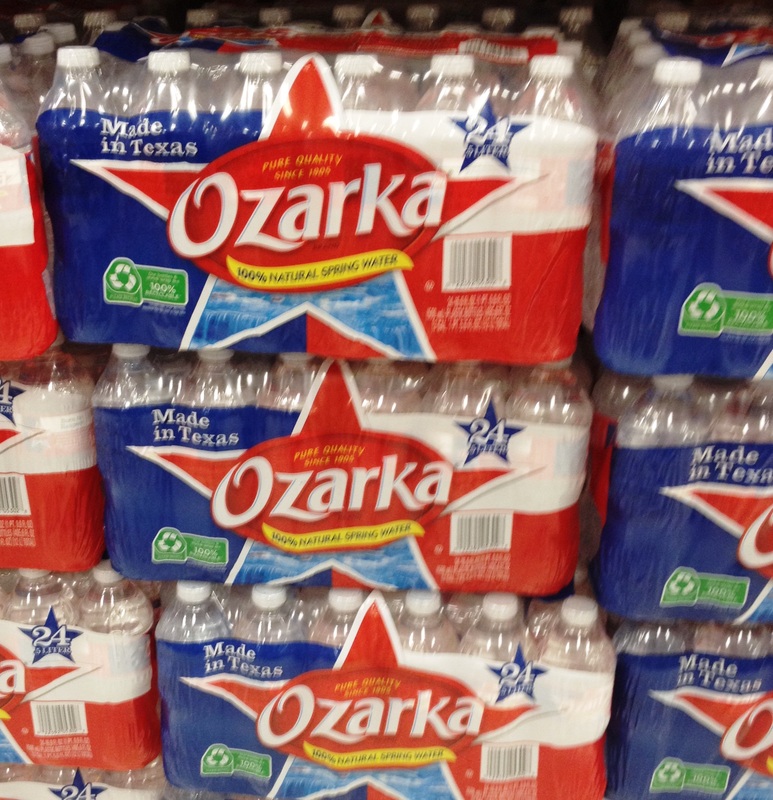 Ozarka is made in Texas because that is where the Spring is. Nestle Waters is a parent organization for several spring waters and Nestle Pure Life. There is a difference in buying store brand Kroger and Evian. Store brand water is a private label company usually through a sister company like Nestle Waters or Coca Cola it boosts sales and knocks out competitive pricing for big corporations. What you have to watch is what you are actually buying. Are you paying $2.99 for a case of Kroger water but 3.19 for Ozarka? How about Desani which is another popular brand. Desani for instance is priced at the same as Ozarka water but Ozarka is Spring water where as Desani is just filtered tap water from Lake Johnson in East Texas. Which would you have ? Clear sparkling water from a protected spring source, or water that some kid probably peed in over the weekend… I think I’ll pay the 20 cents for a protected spring water…. Thanks for commenting, Nicole. I am not a big fan of the whole category of bottled water. One word: plastics. The desire for individual-sized bottled water has created a massive increase in the consumption of plastic. When I was a kid, “bottled water” was a gallon jug of distilled water my mother bought every six months to use in her steam iron. I understand the convenience factor of a grab&go bottle, but I don’t see why so many have to make a bottle of Ozarka their go-to source when they’re just sitting at home or the office. Is the public water supply that bad? Is it really going to poison us? I can only worry about so many things, and this isn’t one of them. Your article was excellent. I too share the authors thoughts about plastics. That being said I also Love Nicole’s comment and thought it was a very informative addition to the blog. When I was growing up in the 70’s my parents would laugh if we asked for bottled water and the one that comes to mind was in a glass bottle tinted green. I can’t remember the name. I thought it was “cool” because I seen Elvis with a bottle. lol. So tap water it was for me! I do occasionally buy bottled water and I personally try to support the local business. So I purchase Ozarka. When I only purchase one or two a week from the convenience store the prices are so close that it really just depends on preference. You’re probably thinking of Mountain Valley Water in the green bottle, from Hot Springs, Arkansas!